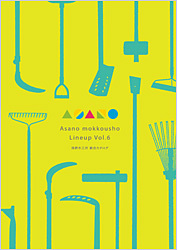 Turf Hoe (hand wrought steel) - 270 mm - Asanomokkou-sho co ltd is the tool factory for gardening,Snow removal,Road construction and Leisure in JAPAN . This multi-purpose hoe is a combination sickle and hoe designed for cutting and gathering grass and weeds, and for cultivation. It can dig holes, loosen soil, cut grass and weeds, and be used to gather soil and cuttings together.